^ ^Torres, Carlos and A. Puiggros. “Part Three,” “Latin American Education”. Colorado: Boulder, 1997: 291. 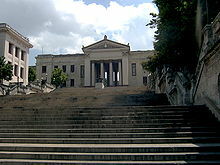 ^ ^ “Education in Pre-revolutionary Cuba”. Census of the Republic of Cuba, 1953. ^ ^Britton, John A. “Part Five,” “Molding Hearts and Minds”. Delaware: Wilmington, 1994: 168. ^ ^ “Education”. UNICEF, 2007. ^ ^ “Federation of Cuban Women”. Cuba, 2010. ^ ^Thrupkaew, Noy. “Cuba: Cuban Women, Beyond Prostitution”. Green Left Weekly #461 (2001). ^ ^ Lewis, Oscar & Ruth. “The ‘Rehabilitation’ of Prostitutes”. The Cuban Reader. Duke University Press, 2003: 395. ^ Kirby Smith and Hugo Llorens. Renaissance and decay: A comparison of socioeconomic indicators in pre-Castro and current-day Cuba (PDF). （原始内容 (PDF)存档于2009-07-13）. ^ ^Kirk, Margo. “Early Childhood Education in Revolutionary Cuba during the Special Period” The Cuba Reader. Ed. Phillip Brenner, Marguerite Rose Jimenez, John M. Kirk, William M. LeoGrande. Lanham, MD. : Rowman & Littlefield Publishers, Oct. 2007. ^ ^ Marquis, Christopher. “Cuba Leads Latin America in Primary Education, Study Finds,” New York Times, 14 Dec. 2001. ^ History of Education. Ed. Daniel Schugurensky. 1998. 3 Mar. 2010 < 存档副本. [2005-09-27]. 已忽略文本“2005-09-02” (帮助)>. ^ See official requirements in: http://www.mes.edu.cu/index.php?option=com_content&view=article&id=189:ingreso-a-la-educacion-superior&catid=4:ingreso&Itemid=21 互联网档案馆的存檔，存档日期2012-07-07.